Abstract class for TIME and TIME(N). : convert_number_to_TIME returns conversion status through two different interfaces: return value and warning. It should be refactored to only use return value. For a column for TIME type, get_date() takes the time value of the field, adds current date to it and returns the result as a DATETIME value. Low-level function to store MYSQL_TIME value. The value must be rounded or truncated according to decimals(). 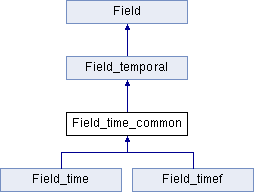 Implemented in Field_timef, and Field_time. Function to store time value. The value is rounded according to decimals().